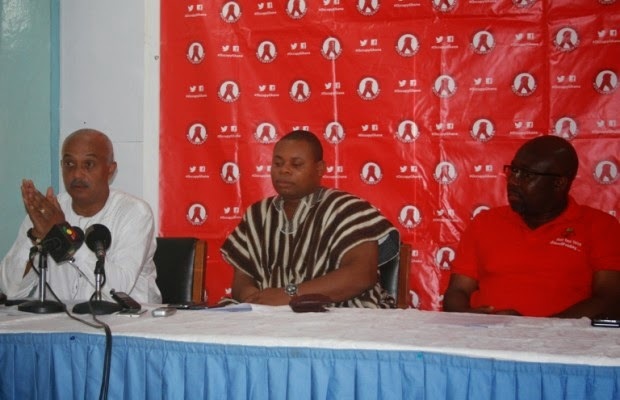 OccupyGhana has called on all Ghanaians, especially workers to wear red attire on May 1 in protest against the ruling National Democratic Congress (NDC) government for subjecting workers to harsh living and economic conditions. Sydney Casely-Hayford, a leading member of OccupyGhana, who was speaking at a press conference, hinted that “we are asking that the significance of May Day on this particular May Day should be shifted, let it become a voice of protest and a voice of complaint to the government. “Let them understand clearly that as much us we are not going to walk the street attempting to destroy anything and create mayhem, we are at least going to register our protest by making sure that we symbolise the day with something red. Speaking on the theme: ‘Red Friday on May Day’, he said government’s refusal to reduce fuel prices at a time when world oil prices had been drastically reduced by more that 50 percent was also a major contributing factor for the high cost of living being forced on the Ghanaian worker. “As Leonardo da Vinci puts it, nothing strengthens authority so much as silence. So we should never be afraid to wear our voice in demand for better governance that will eventually create better environment and living conditions for all. If workers all over the Ghana will do this, we will affect lives positively. So on May Day, let your voice be seen in red,” he stated. The leading member of OccupyGhana disclosed that industries were shutting down while production levels were being reduced due to government failure to effectively deal with the currently energy crisis resulting in massive layoff of workers at all level. “By conservative estimates, over 12,600 formal workers have lost their jobs this year due to the extremely difficult business and economic conditions under which they are operating. This excludes the many undocumented job losses at the micro-enterprise levels; dressmakers, welders, bakers, corn-mill operators and all manner of small businesses that rely on power for their operations,” he said. Mr Casely-Hayford added that workers were being faced by the rapid decline of real wages due to the depreciation of the cedi, increasing inflation and declining rates of wage increase. He hinted that OccupyGhana was working on a major event on July 1 as they prepare to mark their anniversary.